One more month flew by us! Last Monday of April, first Secret Recipe Club of a favorite season, Spring! I was paired with the blog Food Baby Life, and had a blast browsing Susan’s site. She has a well-organized index which makes life a lot easier for the stalker. Being a busy mom, many of her recipes are compatible with our own life style. You know, that life style in which the day doesn’t seem to have enough hours, and each night we ask ourselves “why isn’t tomorrow Saturday instead of Tuesday?” 😉 I had quite a few recipes on a list of favorites to choose from, including her Spiced Meatball Wrap, but settled on this tart because of the unusual crust: instead of butter, olive oil. Instead of white flour, a combination of 50/50 white and whole-wheat. A few modifications of my own for reasons specified in the comments, and there you have it: a Leek and Kale Tart with Olive Oil Crust! Lightly grease a 28cm (11 inch) tart dish, preferably one with a removable bottom, but a Pyrex type will work too. Heat the oven to 390 F (200 degrees Celsius). To make the pastry, place the flours and salt in a large bowl and whisk to combine. Pour in the oil and stir with a fork. Add the water and continue to stir with a fork until it is just absorbed then start to knead with your hand, until the dough forms a ball and comes away from the sides of the bowl. Turn the dough out onto a floured surface and roll out to fit the tart pan. Transfer the dough to the pan, trim the edges and place in the fridge for 30 minutes. While the pastry is chilling, make your filling. Melt the olive oil in a large saucepan over medium heat. Add the leeks and garlic and cook, stirring often for about 10 minutes, then add the kale and cook for a few minutes more, until wilted. Season with nutmeg and remove from the heat and allow to cool for 10 minutes or so. In a separate bowl whisk together the eggs and milk along with salt and pepper to taste. Blind bake the pastry for 10 minutes lining it with parchment paper and filling it with beans. Remove the beans and paper and bake for a further 10-15 minutes or until the edges are golden and the base is totally dry to the touch. Remove and allow to cool for 10 minutes. 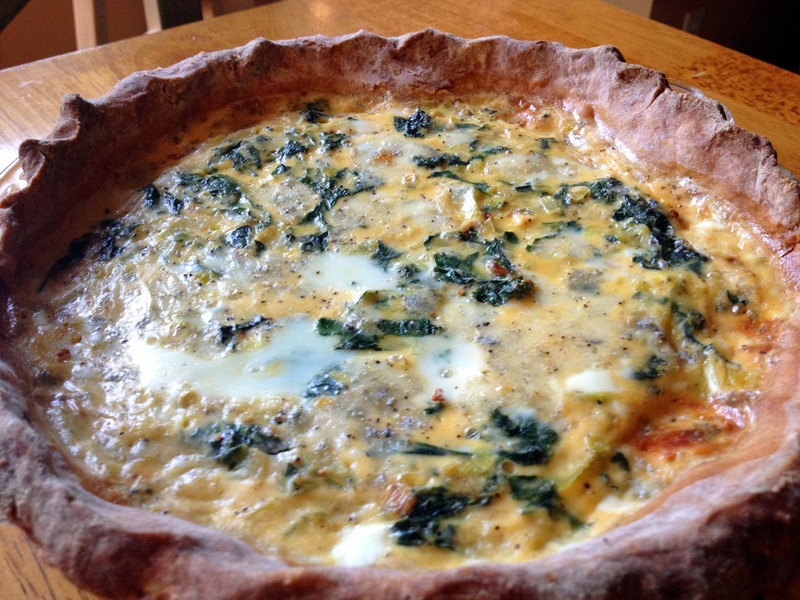 To assemble the tart, fill the pastry shell with the cooked leek and kale mixture, sprinkle over the cheese and then pour over the egg mixture. Bake for approximately 25 minutes. The filling should be just set and the edges of the pastry a deep golden brown. Cool for at least 15 minutes before serving. Comments: What’s life without a little adrenaline rush? You would think that by staying away from cakes I’d be safe, right? Not so fast. Things were going quite well up to the moment of adding evaporated milk to the game. I grabbed my can opener, a little gadget that works like a charm, smooth, graceful, leaving no sharp edges. It usually performs a little magic around the edges, so that you cannot quite tell the can is open, but it is. Or is it really? 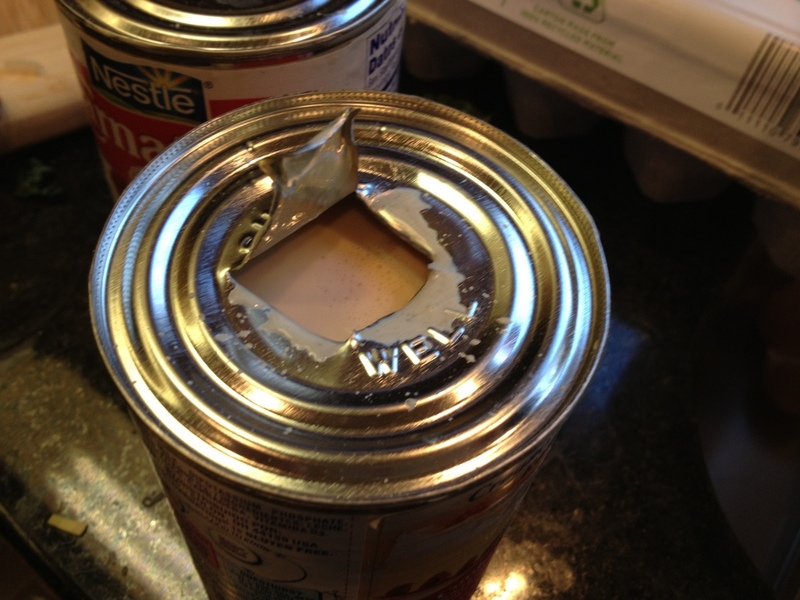 Something about the edge of the can of evaporated milk simply would not cooperate and it refused to open. I had a second can in the pantry, tried to work on it, again no luck. I searched everywhere for an old-fashioned type can opener, but apparently ours was lost during the move. A few slammed doors and drawers, a few words not fit to print, I finally had the brilliant idea of pairing an oyster knife with a hammer. Punched a square hole on top of the can, and back in business I was. (BTW, I don’t recommend doing that, it is both messy and dangerous). To add a little more emotion to the day, I forgot to buy Cheddar cheese for the recipe! I had no cheese around, except for three little triangles of “Laughing Cow Light Original Swiss Cheese”. I ended up mixing it as well as I could to the evaporated milk, and that was that. Finally, If you followed the original link to Baby. Food. Life, you will notice that she removed the excess dough after covering her tart pan, for a very polished look. I don’t know what I was thinking, but obviously I went into a different direction. Oh, well… What matters is that this crust might very well become my default recipe from now on. We both absolutely loved it, it does have a more rustic quality thanks to the whole-wheat flour and the olive oil. Plus, making it in a bowl using just a fork and your hands was awesome! Susan, it was great to meet you and your blog through The Secret Recipe Club, we loved this recipe, enjoyed it three days in a row, it only got better and better! For those who want to see what my fellow friends from group D cooked up this month, don’t be shy, just click on the blue frog at the very end of my post, and happy browsing! And those who are curious to see which recipe was chosen from my blog, and who had it, jump here for a fantastic article by Fran! She made a favorite of ours, Vietnamese Spring Rolls. Using home-grown veggies this will be some spectacular production! Looking forward to reading about it later..
Yum, anything with cheese is definitely irresistible. Isn’t the crust fantastic? It’s become my go-to recipe and even the kids love it. I’m so glad you loved it too!!! That crust is awesome! I intend to repeat some version of a tart using it very soon. Thanks for the inspiration! I’m trying this recipe this week. I guess 125g is 1/2 cup? I really need to go metric in my thinking! Then I won’t bleep over European recipes when I stumble upon them. I usually also wimp out and use a store-bought frozen piecrust for this kind of dish, but I want to try this one because of the interesting ingredients. Thanks, Sally! Sorry I could not reply sooner… finally back in Kansas now. Very tasty, quite different from the “regular” version. And a lot easier to handle. Haha, love the McGuyver’ed can opener 😉 This looks yummy! We love leeks and use them a lot. The crust looks gorgeous but so does the whole tart. I’m sure this is dangerous, but I remember my grandmother punching holes in a can of evaporated milk with an icepick. You heard that right, an icepick. A few were punched on both sides for easy pouring and nobody was hurt. Whew! Sally, I was thrilled to get your blog as my assignment this month–you have so many new and exciting recipes from the usual one sees. I made your Vietnamese spring rolls, and they were just wonderful. I am having trouble linking the post and have e-mailed Sarah for help. Not sure why but the message I got says the linking is closed, yet it’s just 30 mins. since the “reveal.” In case the link doesn’t get fixed any time soon, here’s the link: http://www.fransfavs.com/2013/04/vietnamese-style-spring-rolls/ My husband and I loved the spring rolls, and we both enjoyed browsing your blog immensely. I have bookmarked quite a few of your recipes to try! Thanks so much for coming over and including the link, I was SURE I was an orphan this month, so it was a special thrill to see your comment! I edited my post to include a link to yours… you did such a great job writing up your blog post! Thank you again! Such an elegant recipe, don’t you think? If I had done the crust properly would be even better, but I’ll get there sometime. I am intrigued by this crust. My removable bottom tart pan is only 9″ diameter and 1″ tall. I also have 2 rectangular ones, 14″x 4.5″. Hmm. I think you can use either one, leftover crust is just flour and olive oil.. well, depending on the olive oil you use, it’s kind of painful to toss it, right? Hope you try it, it’s delicious! I’m more worried about filling overflow. I guess I could scramble whatever won’t fit in the crust! As you know, I am pie crust challenged. The vodka crust from CI is the only one I am routinely successful at preparing. It would be nice to have a second option for savory fillings. I have to give you ‘props’ for your determination in getting that can of milk open and the innovation of coming up with something to replace the missing cheddar cheese. I’m all about the filling so I’d probably trim the crust down to half an inch or so. The combination of leeks and kale, two vegetables I’ve only started cooking with in the last 2 years, is a very inspiring one. I have made an oil (vegetable) based pie crust before but wasn’t really happy with the taste … I’m curious about this one with the whole wheat flour. It is a breeze! The hardest part is definitely opening the can of evaporated milk. The rest is cake. Or pie. Or tart. Happy Reveal Day! 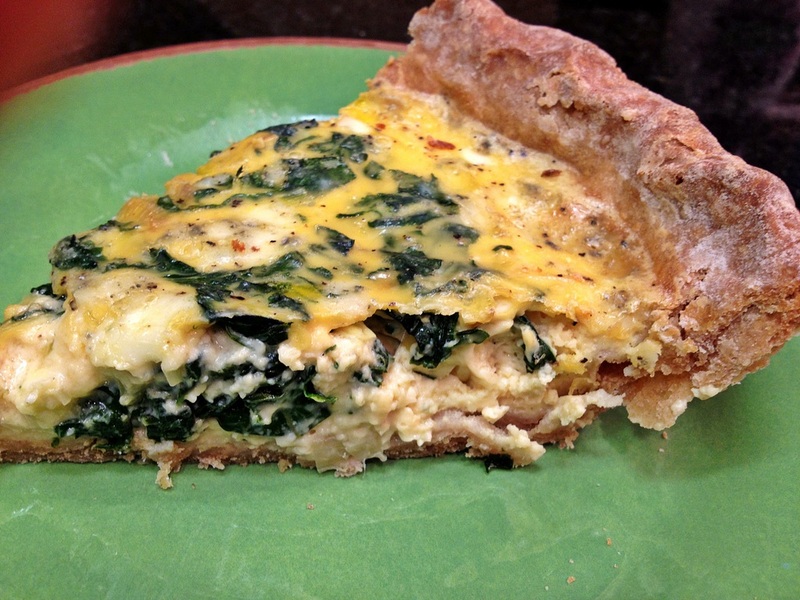 I love that kale is in the tart. Great way to get more veggies. Kale is such a great veggie! I am always searching for new ways to use it… this was perfect! “A few slammed doors and drawers, a few words not fit to print…” heehee, thank you for providing my before bed chuckle. Ah, you stuck with it and delivered the goodies! Just look at the savory delight. And you know what? (and you likely do ;-)) I was just daydreaming about leeks in gym class this morning… tabata workout – omg, intense stuff. Tabata workout! Oh, yeah, baby…. That “almost” killed me. Almost. I had to make sure my lungs were still inside the body, and could not quite remember my full name, social security and phone number at the very end. Fun, though. But very very VERY challenging. I might make a blog about this exercise routine I found – it’s called “maximal capacity training” and the third week of it is three days of tabata. Holy moses! Haha, I’m glad I’m not alone in finding it mega challenging ;-). I love a good olive oil crust! It makes the crust much more savory, somehow. And I had to laugh at the can opener story…because I can’t tell you how many times I’ve done that!